Pause a game and enter any of these cheat codes. You will hear a sound when a cheat is entered correctly. 1 Energy Refill A, B, C, A, B, C, A, B, C - Only works twice in a level. 2 Ten Mealworms C, A, C, A, C, A, C, A - Works best on the Villi People and Circus Of The Scars stages. about, and was a big hit when it was first released. subgames, including an isometric shooter. Groovy! GROOOVEY!!! launching cows! Fighting off crows! all this nad your only a super suited worm!! its great sound story and grpahics! ABOVE CODES FOR EWJ 1 SORRY FOR THE DOUBLE PRINT! BUT HERE IS THE CODES FOR EWJ 2!!!! Hold A + B + Up for ten seconds of protection. at any point in the level. Pause game play and press A(4), B(4). actions to jump to the corresponding level. Puppies One Press C(6), A(2). Puppies Two Press Left, Right, B, C(2), Left, Right, A.
Puppies Three Press Right(2), A, B, C, Left, Right, A.
Peter Pan Press C, B, C, Left, Right, Left, A, B.
Abduction Press Down, A, C, Left, Right, Down, A, C.
Inflated Head Press B(2), C, A, B, C, Left, Right. Sally Press A, B, C(2), Up, C, Left, Right. Soil Press A(2), C(2), B(2), A(2). Meat Press C(2), Down(2), A, Right(2), Left. ISO Press A, B, C, Right(5). Run Jim Run Press B(2), C, Left(4), Right. Unzip Press C, A, C, A, B, A(2), Up. actions to obtain the corresponding weapon. Plasma Gun Press C(4), A(3), B. 3 Shot Gun Press C(4), A(3), C.
Homing Gun Press C(4), A(2), B, A. Bubble Gun Press C(4), A(2), B(2). Nuke Gun Press C(4), A(2), B, C.
This game is fun but I can't beat the last level. 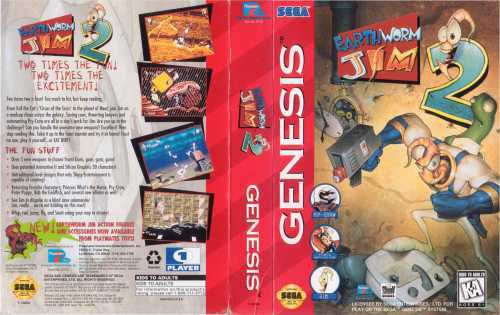 Jim 1 was better on the Snes, EWJ2 had it's best showing on the Sega Saturn. 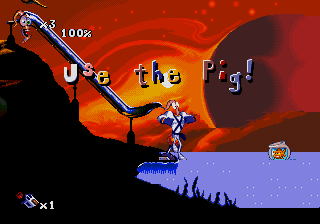 The Genesis version of both games are playable but not as colorful or as sonicly pleasing. A great game series. But'em both! 7 and 9. Just another code, Now go play with your worm! B(2), A, C, Start. The word "cheater"
may only be used once per level. B, C, A, B, A, C.
B, A, C, B, A. B, C, Left, Right, A, Start. 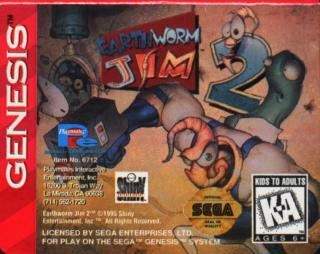 Great games, however the best version of EWJ1 was undoubtedly on the Mega CD! Also, one of the best kids cartoons of the 90s! Graphics are smooth and rich, definitely candy to the eye. The sounds are loud and crisp, also comical. The gameplay is pure fun, you'll be coming back to this game for a week straight, at least. Some of the levels can get a bit annoying/difficult, but still in an entertaining kind of way. 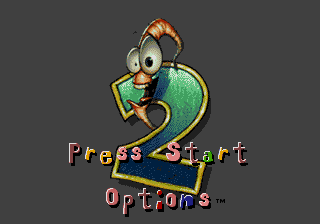 I never played Earthworm Jim 2, but I plan on it really soon. I'm sure it'll be just as dope as this one.